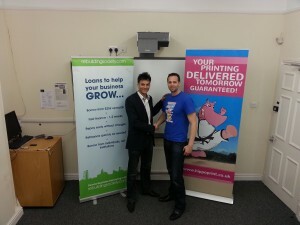 Hippoprint.co.uk, the next-day delivery online printing company, is looking forward to a period of growth after winning a £30,000 interest free loan through peer-to-business lending platform, rebuildingsociety.com. Owners Anthony Wood and David Hanson entered a competition on rebuildingsociety.com to become the ‘most popular’ loan with rebuildingsociety’s lenders throughout the course of March. On rebuildingsociety, individual lenders bid to lend businesses money, which is then repaid in monthly capital and interest repayments on completion of the loan. Bids are ranked according to the lowest percentage offered by the lender, so the more bids a loan attracts, the lower the overall interest rate repaid by the business. Hippoprint.co.uk is looking to expand and the £30,000 will be used to fund a sales and marketing campaign. The company plans to add a number of new products and services to its flagship guaranteed next day delivery service and will be using various PR and marketing techniques, to raise awareness of its services locally and nationally. Anthony Wood commented: “Even if the competition hadn’t existed, we would have chosen to borrow from a peer to business lending platform, despite the fact we could get a loan from our bank. We liked the concept of winning an engaged audience and giving people that know us a financial return ahead of an institution. “Our new lenders include family and friends and other people who have had the opportunity to contact us directly with their questions. “People are taking control of their finances more than ever and peer to business lending platforms are allowing them to make logical, ethical and moral decisions about how their money is invested. Dan Rajkumar, Managing Director of rebuildingsociety.com commented: “We ran this competition to raise awareness of the benefits of peer-to-business lending. Anthony and David’s friends and family might never have heard of the concept before this, but they can all see the value it has given the company now and will do in the future as it wins new business. We are sure that a lot of them will also continue to reinvest in other companies now that they are familiar and comfortable with rebuildingsociety.com. Over 140 individual lenders contributed to the loan, earning an average gross annual return of 9.92%, which will be paid by rebuildingsociety over the two year term.